Candida albicans is one of the indigenous oral microbial floras. which is known to harbor in keratotic lesions of oral cavity. Due to endogenous nitrosation potential of this organism dysplastic changes are usually associated in lesions with candidal invasion. This study was done to see the association of the organism with oral lichen planus and Leukoplakia in smears and histological secrinns. The presence of the nrgnnism was found to be statistically insignificant (p>O.05) in these lesions and there was no correlation between dysplasia and the presence of candidal hyphae in oral lichen planus and leukoplakia. Rhinoscleroma is a rare chronic granulomatous infection predominately affecting the sipper respiratory tract caused by Klebsiella rhinoscleromatis, a gram negative aerobic coccobacillus. This disease is endemic to Africa, central and South America, South central and Eastern Europe, Middle East and China. We report a case of rhinoscleroma highlighting clinical feature, investigations and its treatment. Mucormycosis is a serious infection caused by a opportunistic fungi. The most frequently affected are is the maxillofacial region. A case of mucormycosis of the palatal tissue in a female diabetic patient is reported. Double palate is a unique, congen_it3i, extremely rare and infrequent occurrence in the oro-facial complex. Most of other congenital anomalies of palate are of frequent occurrence and have an early and easy diagnosis. The reported case was an extremely rare and unique with duplication of palate and of maxillary dental arch. The patient had normal mandibular dentition, broad flat-palate very unusual to the age, depressed-nasal bridge, anatomically incompetent but potentially competent lips, hypertelorism with no other skeletal deformity. The patient had already been operated for growth in the palatal region one year ago. The present case needs a multi-approach team management for the future rehabilitation of oro-facial complex. Reports of spontaneous tooth exfoliation and osteonecrosis following Trigeminal Herpes Zoster are extremely rare and have been sporadic. Here we report a case of a 42-year-old man who exhibited prodromal odontalgia before the appearance of vesicular mucocutaneous lesions, together with severe destruction of the maxillary bone and spontaneous exfoliation of teeth. A review and analysis of the clinical aspects and the pathogenesis of Herpes zoster and bone necrosis are discussed. Adenomatoid odontogenic tumor (AOT). is a rear. benign, non-aggressive tumor that comprises of 0.1 % of tumors and cysts of jaws and 3% of all the odontogenic tumors of the jaws. The pathogenesis and stimulus to tumor production is unknown. 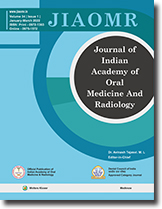 A case of a large adenomatoid odontogenic tumor causing erosion of superior wall of antrum, along with its comprehensive review of literature, pathogenesis, clincoradiographic and histologic features and differential diagnosis is reported. Heck's Disease also termed as Focal Epithelial Hyperplasia is an uncommon benign oral condition characterized by multiple circumscribed, sessile, soft, elevated nodules having the same colour as the oral mucosa. It occurs commonly in younger individuals of certain racial groups. A case of Heck's Disease manifesting in a 5 year old male Tibetan refugee child in India is presented and discussed. Gorlin syndrome is a rare autosomal dominant disorder characterized by multiple basal cell carcinomas, odontogenic keratocysts, tumors, and systemic anomalies. Early diac-iosis and treatment :s of utmost importance in reducing the severity of the long-term sequelae of this syndrome. and review of literature documenting both major and lesser-known manifestations of this disorder is given here.